Man that was a mouth full. I should really come up with a new name for it, but for now this tired mama needs to reserve battery power for more important operations. Like keeping Logan from climbing to the top of the couch and diving off. Moving forward… to a tastier discussion. This is our go to recipe. If I need something to feed a lot of people…I double this recipe, if I want to take a meal to a family…this is my first choice, if I need something fast and packed with nutrition for my kids…bam…here ya go. I love this recipe because I kind of just wing it most times, it’s not a recipe that requires precise measurements to be delicious. If you don’t have bacon or milk, it’s still amazing. If you like your soup to be creamier, use a stick blender to puree a portion of it. Thankfully my kids prefer it with all the big chunks, one less step for me! Now, I am going to lay down my pride and admit I didn’t know what a leek was until about 5 years ago. It was so bad I had to look up a video on how to cut a leek. I know….it’s terrible. But just in case there is some newbie to whole foods out there like me …staring at this strange vegetable they bought for a recipe and have no clue what to do with it. Here ya go. Blessings. It’s going to be your new favorite vegetable to add to soups. And mild enough that my kids love it. When I cook my bacon, I use kitchen scissors to cut it up into small pieces and let it fall into my skillet as I cut it. You can cook your bacon in whole slices and cut it up later. Totally up to you. If you use regular bacon you can reserve the bacon grease to sauté your vegetable and skip the olive oil. If you use turkey bacon like me, there is no leftover awesomeness to speak of. Cook your bacon till it is nice and crispy so it will hold up well in the soup. While the olive oil is heating over medium heat, chop your potatoes into cubes. Peeling the potatoes isn’t necessary, but if you prefer no skins then peel away! Place the potatoes into your pot. 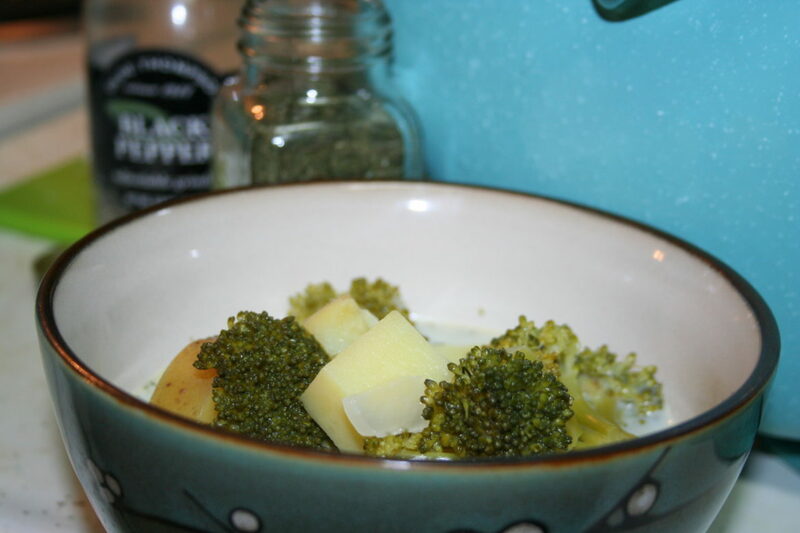 While the potatoes begin to sauté, chop your broccoli and add to the potatoes. Begin chopping your leeks and add them as well. I usually add a tablespoon or two of butter at this point to help release all the nice brown bits at the bottom of the pot. Sauté for another 3-4 minutes, or until the leeks have a nice sauteed look. Add in the minced garlic and sauté for 1 minute. Add chicken broth and bay leaves to the stock pot. Cover and lower heat to med-low. You want it to be a low boil, not roaring. Check every so often and when the potatoes can be pierced with a fork you can remove from heat. Add the cream (Note: cream makes a far tastier soup. But if you are like me cream is sacred and sometimes mama’s coffee needs it more than the soup.) or whole milk. Once you add the cream/milk it will be much easier to see the bay leaves. I would suggest fishing them out at this point but it won’t hurt anything to leave them in there. I just wouldn’t consume them. I love dill, the more the merrier, but I would suggest starting out with a smaller amount and adding to your taste. Salt and pepper to taste as well. From beginning to end this maybe takes 35 minutes. About 15-20 of those minutes is the pot just sitting there on a low boil. For a busy household, I call this meal a win. One pot meal of awesomeness. Feel free to take this recipe and adjust it till your heart’s content. Now where is the cornbread? ?